In the days following the presidential election, the press reported an uptick of cyberbullying. We’re happy to say that the schools we spoke with did not share that experience. Still, it’s always the right time to take stock of your security practices and make sure they are still working for your district. If you’re in need of some new methods, here are a few to check out. “We’re not just monitoring chats these days,” says Michael Estrada, chief technology officer at South Plainfield (NJ) School District. “Since our students collaborate online we have to worry about documents, emails, pictures they save, and content they post.” For instance, is a student using the word gun for a report or is he talking about bringing one to school? Estrada says students also use Google survey tools to determine “which girl is ugliest” and other inappropriate things. South Plainfield has been 1:1 for a few years, so it is comfortable with maintaining control in a mobile environment. At first, teachers walked around the classrooms to make sure students were on task. With Lightspeed’s tools, teachers can see the students’ screens on their own laptops and can use the filter to do what they need, whether that’s blocking Wikipedia or blocking every site except the one they are using in that session. They can also override blocks created by Estrada’s department, which makes everyone happy. Omaha students learn about creating smart digital footprints. Last year, Omaha (NE) Public Schools (OPS) used the Houston Independent School District model and bought Surface Pro tablets and wireless displays for their secondary teachers. The district currently has an RFP to buy devices for secondary students. But before everyone has computers in their hands, the district devised a sound security strategy. 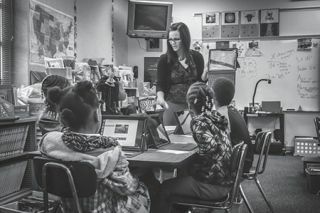 As part of the district’s partnership with Microsoft, every school can have one to three educators become a Microsoft Innovative Educator (MIE). Korf was able to incorporate Common Sense Media’s digital citizenship curriculum into the MIE program so the teachers also became Common Sense Media knowledge experts and will teach about digital citizenship in their schools. “Every school will earn Common Sense Media digital citizenship certification this year. We’re using it as an opportunity to talk about preventing cyberbullying, creating a positive digital footprint, and turning students from bystanders into upstanders,” she says. For more information on the Common Sense K-12 Digital Citizenship curriculum, go to www.commonsensemedia.org/educators/scope-and-sequence. Ralph Barca, chief technology officer at Edison Township (NJ) Public Schools, believes in a multilayered approach when it comes to security. “We do a lot of education and have firewalls, policies, content filtering, and more,” he says. But the key to his operation is Gaggle Safety Management. Online safety is a priority for all students at Edison Township. It’s a major financial investment, as the district is completely 1:1 with every student account covered, but Barca believes that it is part of the responsibility in providing a take-home device.